← Disney Day 4: Magic Kingdom and Night Swimming. Are You Pinterested In My Disney Trip? And then OHMYGOD I was addicted! Like…now that we’re back, I kinda miss it. Okay, so here are the ones I made, the ones I really loved, the ones my kids loved, and my favorite resources. 1. 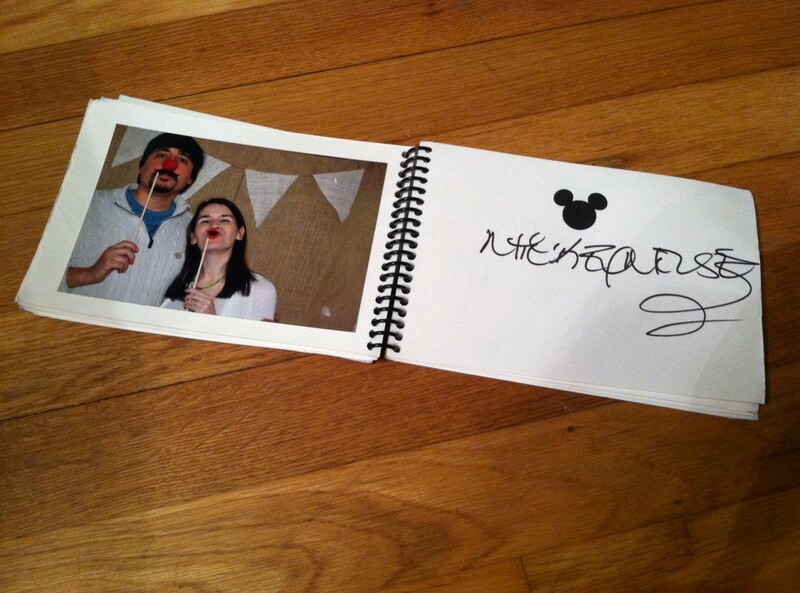 Personalized Disney autograph books/photo albums. I put this first because it was my pride and joy! So here’s why I loved these: They’re made to hold autographs, and pictures. It’s personalized. They’re cute. And y’all — they were pretty easy to make. She tells you how to do it, you just have to actually do it! But I made each of the books knowing what parks we would be visiting. 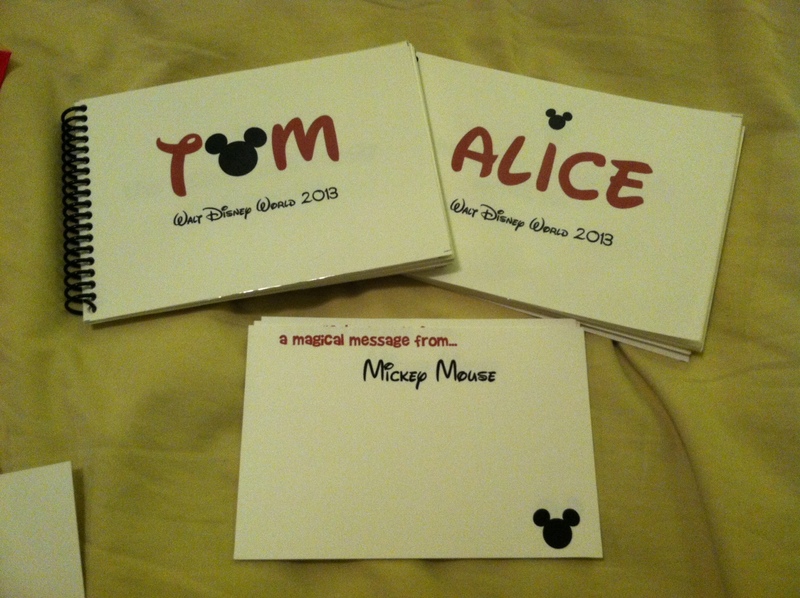 So for Tom and Alice’s books, the sections they have to post pictures in are: Animal Kingdom Lodge, Magic Kingdom, Animal Kingdom, Epcot, Magical Memories (just random stuff), Magical Messages (more on this in a sec), and then Signatures. And the idea is to just tape the pictures in here. What I really love is that since my children can’t read, they have no idea what the signatures say — but when I put the photo beside it, they will. I think it was pretty awesome of Dixie Delights to share how she did it so I could make these for the kids. They really loved them! 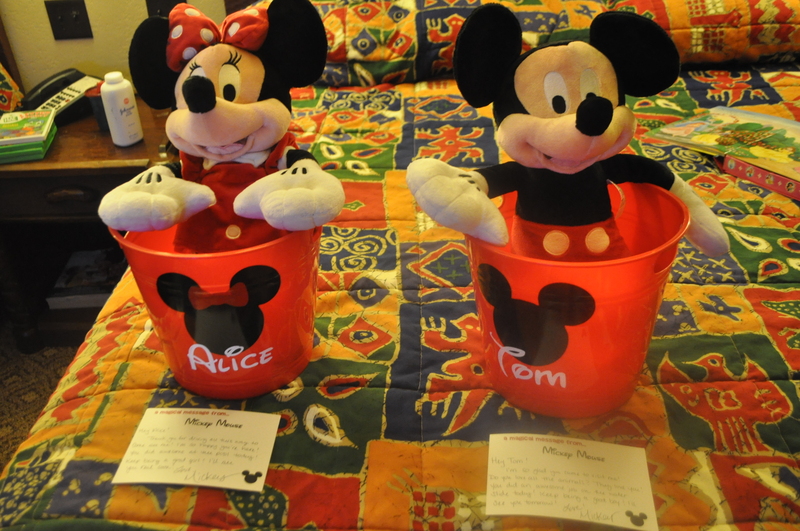 Also from Dixie Delights blog, I loved the idea of giving the kids a surprise each morning from Mickey. I liked the idea of it making the day extra special, and I did hope that it would keep them from wanting more expensive stuff from the parks. So! 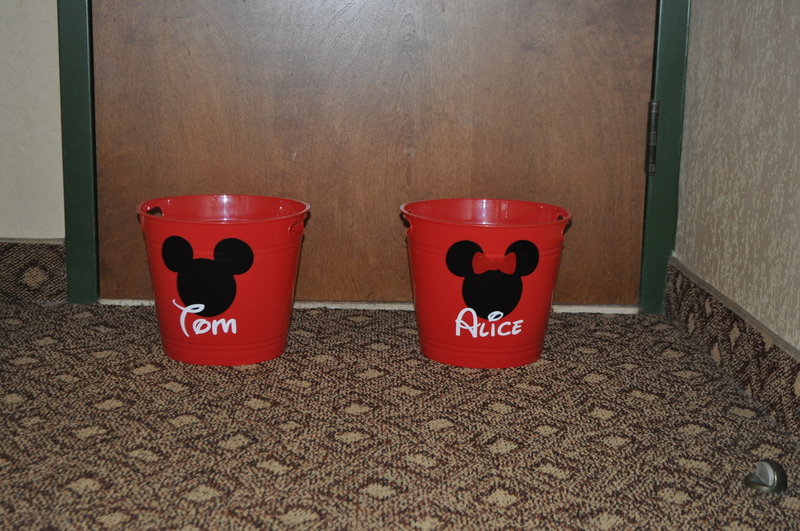 I bought the buckets from the Dollar Tree, and got the decals with their names on it from this Etsy seller. I made 4×6 cards (so they’d fit in our memory books!) that said “a magical message from Mickey Mouse” using the same fonts I used for the autograph books and just made them look like the ones from Dixie Delights. And each morning when the kids woke up, there was their message with some little gifts in their bucket. I mean, it was a huge hit. The first day they each got a pair of sunglasses (CVS), glow wands (Dollar Tree), a handheld fan that glowed (Target), and a water bottle (Dollar Tree). I want you to know — they loved it ALL. Like…played with it throughout the day, LOVED it! I’m going to share a picture of some of the stuff I gathered for these buckets, but please know that I didn’t actually end up using all of it, or I used some of it in other ways (like in the car). Because it’s a little scary. Ha! That water bottle up there in the bottom left that I gave them the first day? That’s the biggest hit of all. That made my children want to drink water and it still does. 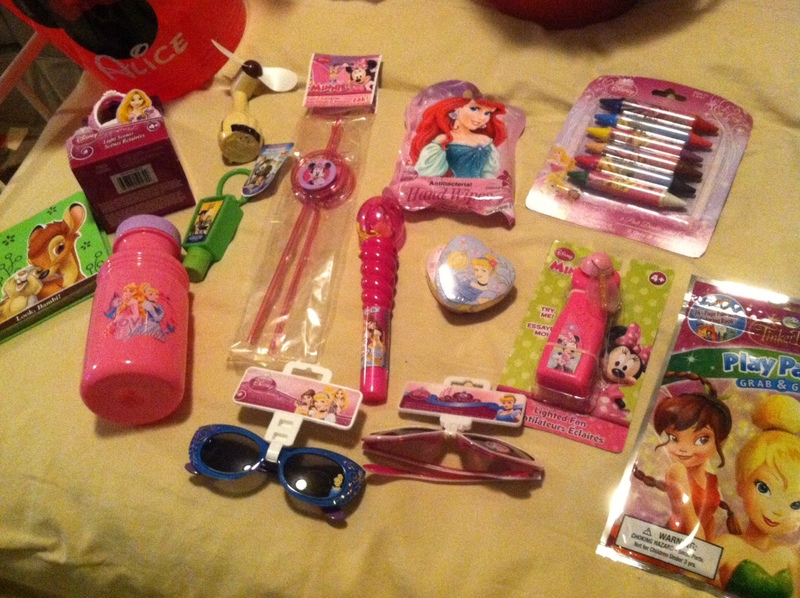 The Dollar Tree and the Target dollar bins have SO much Disney stuff! It’s insane, and very hard not to gather it all up when you’re obsessed with themes like me. It was great fun, though, and it’s something we’ll keep up for future visits. So I just bought some fabric and was ready to make a TON of shirts! Seriously, once I got started, I couldn’t stop! And for some of the shirts, I used these free templates from this nice blogger! 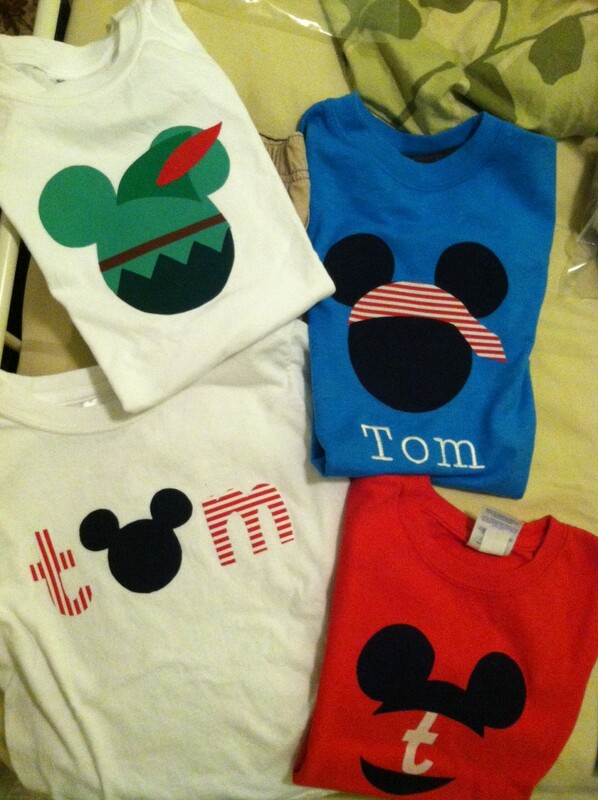 For Tom’s name shirt, I just used the same Brady Bunch font that I used for the memory books, and used the Mickey Mouse symbol from the Waltograph font for his “o”. I got the Peter Pan shirt idea from Etsy. And I just made shirts to my hearts content. Y’all — SO easy and fun and way cheaper than buying an appliqued shirt. Pressed penny machines are those machines where you put in 50 cents, and your penny, and then turn the crank, and the penny comes out with a design smushed onto it. 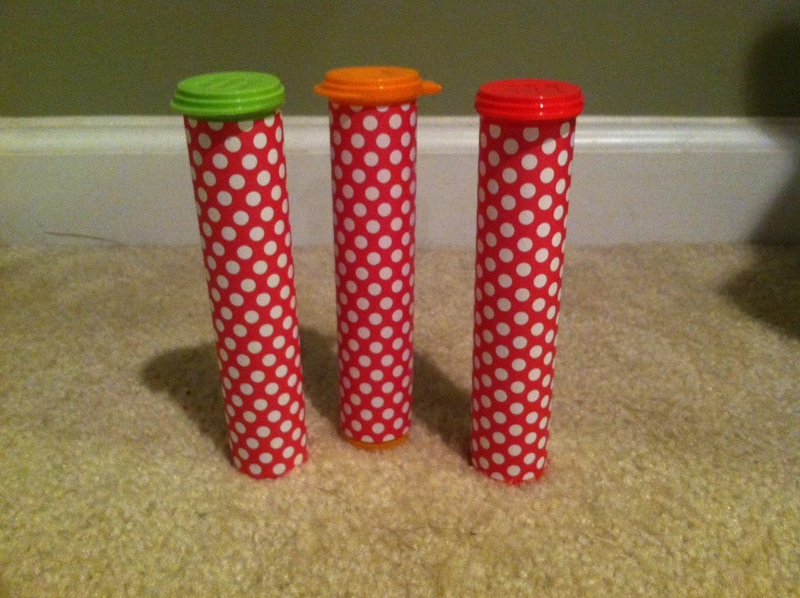 This idea was all over Pinterest, but basically, these are tubes from mini M&Ms (I got mine from Publix), and I stacked 2 quarters with 1 penny, over and over so when we saw a Pressed Penny machine at Disney, we’d be all ready without having to hunt for change. I made these for all the kids and would you like to know who loved this the most? I think the kids were interested in…Disney World or something crazy, but man, I really thought these made great little (cheap!) souvenirs! And if you’re feeling *really* nuts (like I did!) then here is a link to the maps with pressed penny machines! The excitement I felt when I got the “tinkerbell” pressed penny and the “peter pan” pressed penny (for the kids! I swear!) is kind of scary. Also? 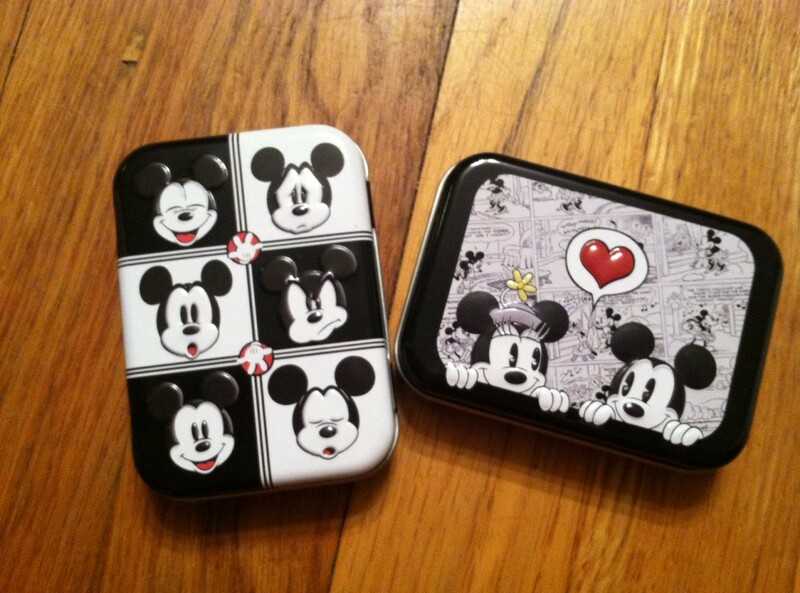 I found these containers at the Dollar Tree checkout. I used these to keep our pennies after they’d been pressed. The originally had Q-tips in them? That’s weird, right? You know what isn’t weird? PRESSED PENNIES! 5. 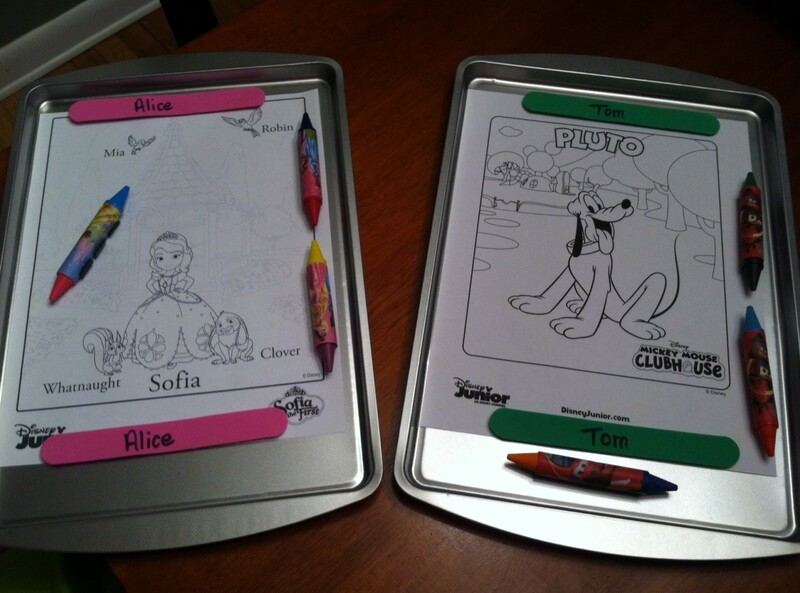 Magnetic Coloring Pages and Crayons! This is going to seem weird — but I thought of this ALL BY MYSELF. I feel the need to tell you that, as I’m sure someone else has thought of it and it’s all over Pinterest — but I didn’t see it and therefore, I am proud. These are Dollar Tree cookie sheets. 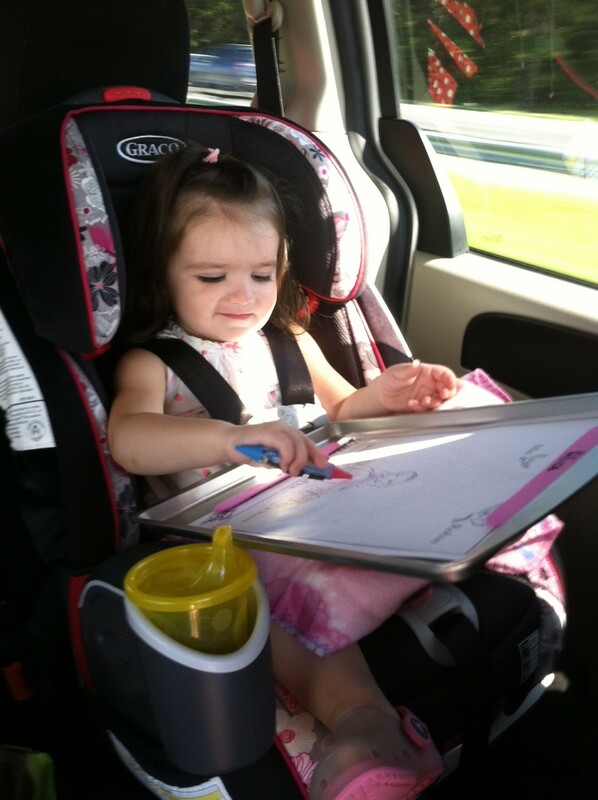 Instant coloring table for the car! 6. 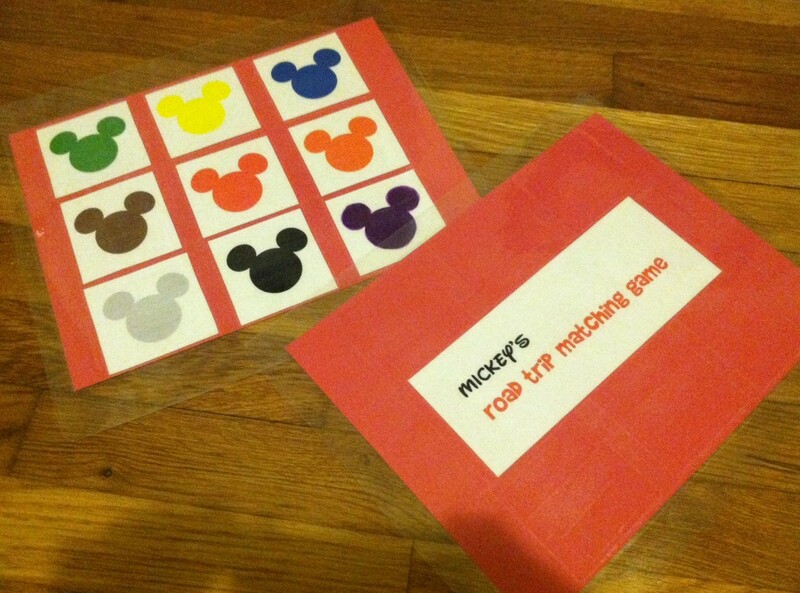 Mickey’s Road Trip Matching Game. This idea also came from the Dixie Delights blog because clearly, I want to be just like her when I grow up. She used some Disney paint chips her mom found at Home Depot, but I don’t think they make them anymore, so I just made them on my computer by using the Mickey symbol from the Waltograph font. I had them laminated at FedEx/Kinkos because their lamination is super thick, so we could use washable markers or dry erase markers on them over and over. The idea was to use them to play games in the car — find each color car, find each of the colors on signs, etc. My kids were too little to really get it this go round, but I’m saving them for future trips. Yes, I decorated their snack cups. These cups are the ones you see that have mini Nutter Butters, Oreas or Chips Ahoy cookies in them. And I glued plastic figures from Dollar Tree on top. And I taped scrapbook paper to them. 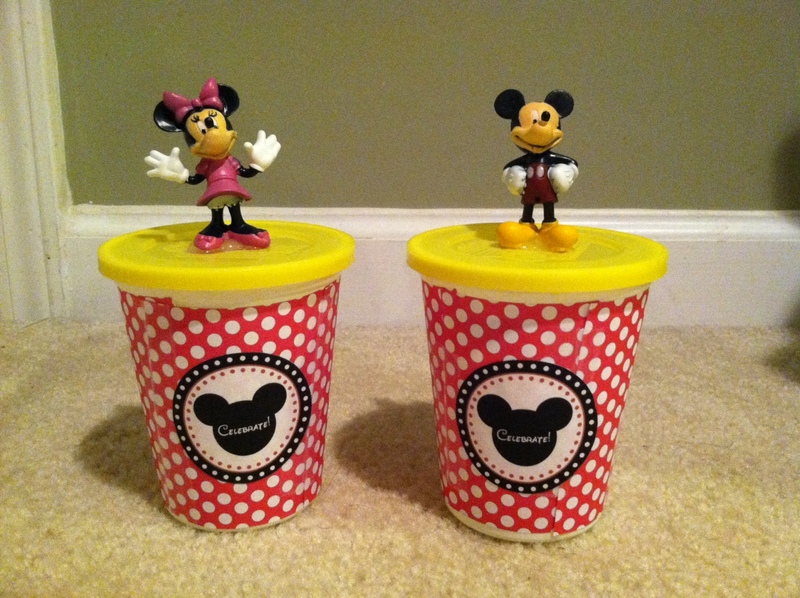 And I put these free printable Mickey circle cut outs on them. And I’m a huge dork. 8. I read everything It’s All Good In Mommyhood had to say. She was my own personal Disney friend, and she doesn’t even know it. She’s been to the parks a bazillion times. They DRIVE 19 HOURS to get there every year. So yeah, I totally trust her. She’s the one who told me (and everyone who reads her blog) to do the Tusker House for breakfast early. I thought she had awesome advice, and even though I didn’t use all of it, it was still helpful to read it! We’d be friends in real life, I’m totally certain. The only reason I did all of this, was because I thought it was fun. I really loved it! What I’m saying is, you in no way need to do anything like this to have a lot of fun on vacation. My kids would’ve had fun no matter what! It’s just that they happen to have a mom who is addicted to Pinterest, and themes, and crafting — so they have to put up with all this crazy. Thanks for reading all about our trip! We had a wonderful time and it was so fun to relive it this week with these blogs. This entry was posted in Alice, Crafts, Disney, Motherhood, Tom. Bookmark the permalink. 6 Responses to Are You Pinterested In My Disney Trip? This is awesome. Love all these ideas. I started an autograph book for Olivia before our last trip to Disney (in 2011). I have yet to finish it-you are right they are time consuming but I will get it done before this trip! Oh. My. Word. Clearly, you have not slept in months. Also? Next time I have enough money to take my kids to Disney, will you take them for me? It’s obvious they will have much more fun with you. Last time we went, I thought I was clever for baking cookies ahead of time and taking them in our backpack. So every time the kids wanted some ridiculously expensive park snack, I could say, “Hey, want a chocolate cookie?” That right there was the height of my cleverness. YOU, my friend, are in another league entirely! Wow. I want you to know that your reply made my night — like, I’m still laughing out loud I love it so much! LOVE you! wow. really wow. I don’t know how you did all that. Did you start planning like… before you had kids? Because that right there is a lot of awesome. Very impressive! You did a wonderful job!!! I know the kids loved every bit of it!